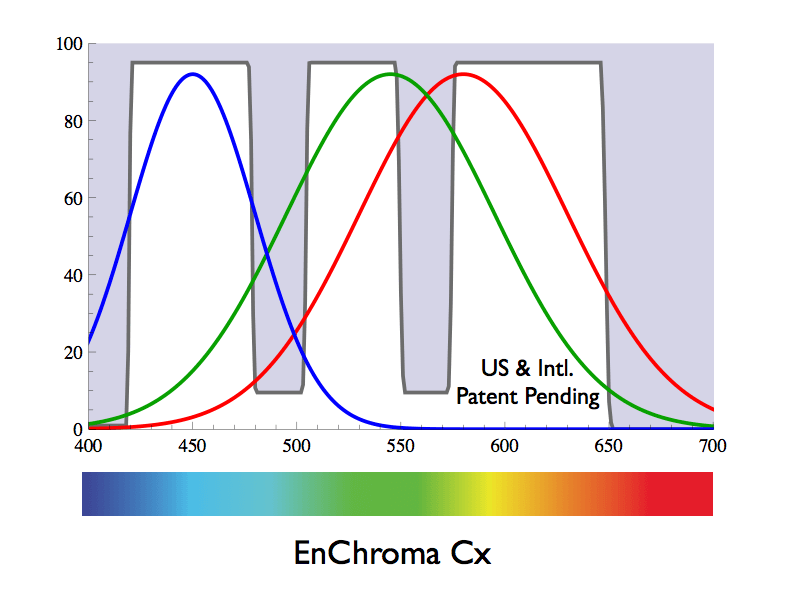 Why does color vision improve in color-blind persons using these filter glasses from Enchroma? Will a color blind person be able to see the same colors on a television? I'm asking, because the colors for every point on a TV screen are combinations of red, blue and green. Optical filters can optimize color contrast, but never restore color blindness. Filters remove colors, they can never add anything. However, glasses like this can prove helpful for certain sub-populations of people that are partially color blind. First, the term color blindness is deceptive. It is better to talk about colour vision deficiency (CVD). This, because many people labeled as color blind in fact have all the red, green and blue cones like the normally-sighted. These people have protanomaly (abnormal, but still functional red cone photopigment), or deuteranomaly (abnormal green cone photopigment). These two conditions are mild and don't affect daily life too much (source: NEI / NIH). The other two most common forms of CVD are protanopia and deuteranopia. Protanopes have no working red cone cells and deuteranopes have no green cones. These conditions are more severe and do affect daily life as color perception is compromised. These conditions can be coined color-blindness, as these folks miss one type of cone altogether (source: NEI / NIH). The glasses of Enchroma target the first two conditions, namely the anomalies and not protanopia or deuteronopia. The Technology page of Enchroma explains why. Basically, protanomaly and deuteranomaly are characterized by the red and green pigments having a shifted spectral maxima. The end result is the same, namely more overlap between the spectral absorbance curves (shown for deuteranopia in Fig. 1). In normal vision, the overlap is already pretty extensive, meaning that green light activates a large portion of red cones and vice versa. In protanopia or deuteronopia this effect is further increased, resulting in a degraded capability to separate reds and grees. For example, protanopes perceive reds, oranges, and yellows as greener, and colors are not as bright. Deuteranopes perceive yellows and greens as more red and they have difficulty telling violet from blue (source: NEI / NIH). What Enchroma has come up with is actually really clever (!) - they've put a spectral notch filter in place and wedge it in-between the red and green spectral optima, thereby removing the large area of overlap. This reduces brightness, but it will enhance contrast when the glasses are worn (Fig. 2). And yes, above considerations hold for any colored object, including monitor pixels. Not the answer you're looking for? Browse other questions tagged vision eyes sensation or ask your own question.